Amsterdam Centraal Station is where you'll arrive into if you're taking the train from Schiphol Airport to the city, or if you travel by international train. 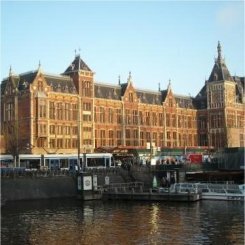 This page - see our other page about Amsterdam train stations for details and a map of all nine Amsterdam train stations. Tip! Order your train e-tickets online. You don't have to order a ticket from the difficult machines. You don't have to check in with your ticket. Once you arrive into Amsterdam Centraal Station, you will generally want to take the main exit at the south end, leading to the city center. Heading north leads to the ferry to Amsterdam Noord, a residential area with some nice forests that may be a good idea to visit during the sunny summer months. The station itself is a 10 minute walk from Dam Square and the Red Light District and forms the terminus of many tram and bus lines. 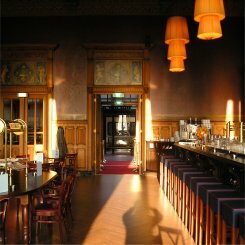 If you are staying close to the city center then you may even be walking distance from this particular Amsterdam train station. There's a taxi rank just outside the western hall (meaning, to your right when you get out at the main exit). There are taxis days and night (but you can always call one at 020-7777777). The bus stops are at the other end of the station: when leaving the main hall, turn left and walk past the tram stops. Both local and regional buses depart from there. Buying tickets for trams or buses is best done at the AKO book shop or the GVB ticket office outside the station. You can also buy them inside the bus and tram (but not inside the metro) but they're more expensive then. There are many shops in Amsterdam Centraal Station, including a small Albert Heijn supermarket, a pharmacy, book and magazine shops, and gift shops. Takeaway stalls and pizza are available downst at twhile upstairs, at platform 2, hungry travelers can find a Burger King, a Ben & Jerry's shop and the classy, large 1e Klas Grand Cafe. In this 19th century dark-wood restaurant and bar, some proper food as well as a refreshing drink can be bought in comfortable surroundings. This lounge is worth a look on its own merits and means that waiting around in an Amsterdam train station can be a surprisingly enjoyable experience. The NS Hispeed Lounge is a facility offered to first class and business travellers at Amsterdam Centraal Station. Those waiting for an international train can relax here in comfort or use the peace and quiet to complete some work. The left luggage is in the eastern hall, down the stairs to platform 1. Clean public toilets are also at platform 2 and elsewhere. Exchanging money is possible at the GWK office and there's a regular ATM (from which you can get euros with your foreign card) next to the south-western exit. There are a number of options for purchasing tickets at any Amsterdam train station; most stations have both self service machines and (except for the small stations) a ticket desk. Local tickets at Amsterdam Centraal Station can be bought either via the yellow-blue machines just inside the doors or in person in the ticket office to your left as you enter the station. At the ticket office take a number and wait to be called, where a member of staff will help you with your purchase. If you choose to purchase your ticket on a machine, it is important to be sure what method of payment it uses before getting in line; some machines take cash but check first for the slots as many only accept credit or debit cards (from the Visa, Maestro or Cirrus systems). When planning your trip, use www.9292ov.nl - it contains both train, bus, metro and tram schedules so you can plan your trip from door to door for free. Or call 0900-9292. For international train tickets, Centraal Station has an international ticket office, but it often has long waiting lines. Alternatively, you can order international tickets at www.nshispeed.nl or by calling 0900-9296. Also make sure to check out these discount tickets. Amsterdam Centraal Station has 15 platforms divided into A and B areas. Check to be sure exactly which platform your train is on as the letter may mean you have to wait at the other end of the long platforms. The yellow boards list the regular departures. Any delays will be listed on the small white boards above the platforms, and announced on the sound system (also in English, German and French if they are international trains). In the big halls downstairs, there are also video screens showing upcoming departures. For all your questions, ask the information staff at the booth just inside the entrances. They speak English. Trains to Amsterdam Schiphol airport depart from platforms 15 and 14A and generally run every ten to fifteen minutes. The information points generally have a list of all the upcoming departures to Schiphol and there is a separate departures screen listing the airport trains. 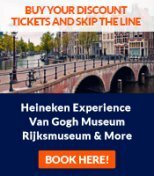 As this is a common trip from any Amsterdam train station, tickets to Schiphol will be one of the first available options on any self service ticket machine. Amsterdam Centraal Station was built between 1881-1889 by Pierre Cuypers, the same architect who also built the Rijksmuseum,2 and his collegue Dolf van Gendt (who also built the Concertgebouw). It was built in the style of the 'Dutch Renaissance', which was quite popular at the end of the 19th century. Three artificial islands were built in the IJ to host the Central Station (as it had to be built in the Medieval city center). Like all buildings in Amsterdam, the station is built on poles, as otherwise the buildings would sink away in the swampy soil.